(Jim Konst) Members of the Lady Bobcats basketball team from Garrett Junior High, front row, from left, Kiley Flowers, Chiara Steffes, Alexis Farrar, Sophia Muelrath, back row, from left, Coach Jim Konst, Addie Doane, Julia Carmichael, Haley May, Rose Randall, Ellie Speaker and Callie Torgesen celebrate their third-place win at the 2019 MLK Middle School Tournament played Jan. 18-21. They defeated Roy Martin Middle School 29-11 on Jan. 19. Kiley Flowers was the high scorer with 10 points. Julia Carmichael added 5 points, Chiara Steffes and Alexis Farrar added 4 points, and Ellie Speaker, Addie Doane and Rose Randall added 2 points each. In their first game Jan. 21, Garrett lost to Cram Middle School 29-19. Doane was the leading scorer with 8 points, while Steffes had 6 and Carmichael had 5. The Lady Eagles won the third-place game against SLAM Academy 17-15 in a hard-fought battle, Konst said. Carmichael led the way with 9 points, Flowers had 4 points, and Steffes and Doane each added 2 points. The other members of the 2019 Lady Bobcats basketball team are Kennedy Barrow, Bree Leavitt, Haley May, Sophia Muelrath and Callie Torgensen. “This is talented group of young ladies who have been working very hard on their basketball skills and teamwork. They are fun to coach and I am very proud of all of them,” Konst said. 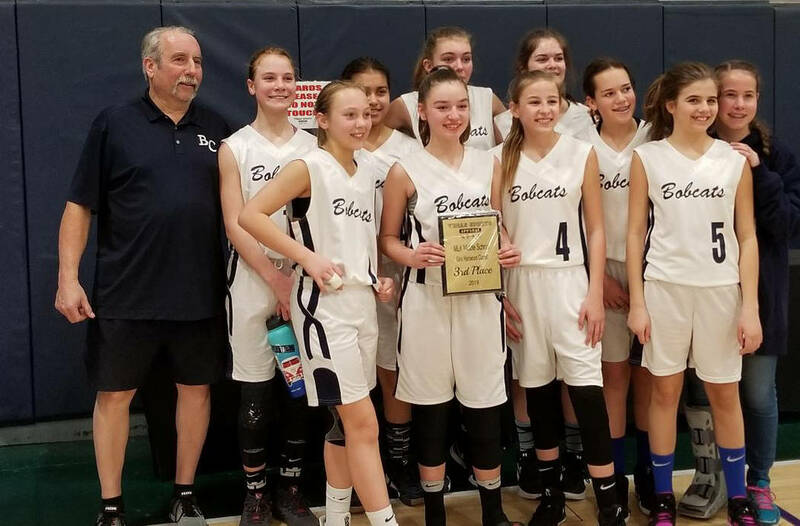 The Lady Bobcats are tied for first place in the Southeast Division 2 of the Clark County School District Middle School League with a record of 3-0. Their overall record is 10-2.